The process of evaluating a simple application for insurance in a quick manor following strictly defined underwriting criteria. Also know as jet screening. 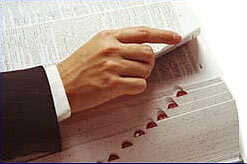 An annuity contract that provides an income benefit payable until the death of the first of two or more persons. The income benefit is higher than it would be if the benefit was payable on a single life since the payments stop on the first death. A life insurance plan covering two or more persons that will pay a death benefit upon the first death. Due to the greater probability of a death occurring, premiums for this plan are higher than single life coverage. Also see survivorship life insurance. A form of joint property ownership where two or more parties own property and at the death of one, the survivors retain complete ownership of the property. An agreement between two or more parties to work on a project. The agreement is generally limited to a single project.